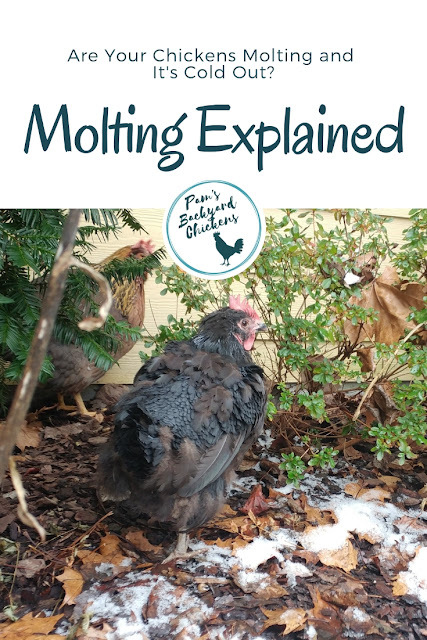 Molting is a natural process that chickens go through at different times in their lives. A chicken's first molts take place as it grows from a baby chick to an adult. Because they're babies, we tend to think of this as a process of growing up, and it is, but it's technically molting. As adult chickens, molting takes place in late summer and fall when birds replace old feathers with new plumage. If you observe your birds toward the end of summer, their feathers are starting to look a little ragged. Some may be broken or missing bits and pieces. This is normal. your chickens are outside in the elements each day and hard at work scratching and pecking for food. Feathers get a little worn out after all this activity! Molt timing is critical because feathers equal warmth. As birds enter the cold, winter months with feathers that are new and in nice shape, they are best prepared to stay warm. When Do Adult Chickens Molt? Adult chicken molting happens around 18 months old and each year after. Feather loss starts at the head and then travels down the body. Some chickens will molt “hard” meaning they lose their feathers quickly and then look bare as new feathers are growing. Other chickens molt slowly with only some bare patches showing or no bare patches at all. Their molt may be barely noticeable to human caretakers. 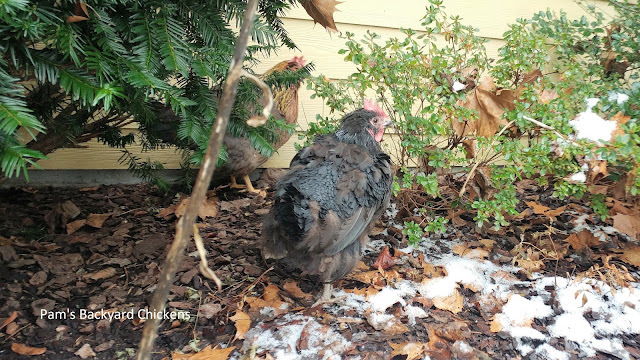 It's Cold Out and My Chicken is Molting! With finicky fall weather, sometimes molting can take place when it's warm and sometimes molting can take place while snow and ice are on the ground, especially if birds are molting in later fall. The good news is that usually all flock members aren't molting at the same time, so those with newly-growing feathers can roost at night with those in full fluff and keep warm. During the day, chickens are normally moving around enough to keep warm. How Long Does a Molt Last? The process of annual molting takes about eight to 12 weeks to complete and is normally triggered by decreasing daylight hours. Feathers are about 85% protein so you can help your birds stay healthy during molting by increasing their protein. A good way is through protein-rich snacks like black oil sunflower seeds, nuts, peas, soybeans, tuna fish and cat food, to name a few. I also add Feather Fixer by Nutrena to my chickens' diet during molt. It has increased protein and seems to really help. Both roosters and hens molt. Hens will decrease or stop laying eggs during this time since all their energy reserves are being used to produce new feathers. During a molt, your chickens may act a little "off" and not have as much energy or enthusiasm as normal. It's important to monitor your chickens and to know the difference between sick chicken symptoms and a molting chicken. A molting chicken is not technically a sick chicken. Remember, molting is supposed to happen! Adult chickens losing feathers at other times of year should be investigated. There can be many reasons for losing feathers off-season. Chickens that are under stress or are infested with parasites can lose their feathers. Also, chickens without adequate food, water or light can be forced to molt. Tip: It's important to remember not to handle your molting chickens too much. Growing feathers can be painful to the touch. What is Molting in Young Chickens? Young chickens start molting quickly at just six to eight days old replacing down for feathers. And then again at eight to twelve weeks old replacing baby feathers. FYI - The second molt is when male chickens get their ornamental feathers, so that's when you know who is who. Six to Eight Weeks Old Downy feathers are replaced by baby feathers. Yearly After First Molt Adult feathers are replaced.